» Smart Nora Reviews: Is This The Best Anti Snoring Solution In 2019? ​Sleeping is something we do so often and yet it can be quite a troubling thing to some people. Snoring happens in about 45 percent of people occasionally and about 25% of people are habitual snorers. Snoring happens when a person is sleeping and it increases in volume throughout the night, or throughout the sleep because the muscles in the upper throat relaxes which causes the airway to collapse more hence causing a vibration of the tissues in the throat which results in snoring. When you are awake the muscles in your throat are holding your throat open and when you are asleep the muscle collapses. This is why you don’t snore when you’re awake. There are a few levels to snoring. When you start to fall asleep and in the beginning of your sleep you don’t snore yet, once you reach a stage you start snoring a little and then the snoring volume increases while you sleep. The snoring will reach a level where it starts to disturb and wake or trouble your partner’s sleep as well. Below will be a graph that shows you the level. There are many snoring solution products in the market all trying to resolve your snoring solutions. However, most products would require you to place something on certain parts of your body. There is a snoring solution product that is contactless which will not cause you any discomfort trying to put an object in your mouth or near your jaw. The Smart Nora is a contactless snoring solution, built for periodic snorers and snorers who cause their partner to wake up. Below we are going to share with you about the Smart Nora in detail, from how it works to the disadvantages and advantages the Smart Nora has. The Smart Nora is a snoring solution device. It is multi-component listening device to help improve snoring problems. The Smart Nora is able to listen to snores and detect will detect before the snoring becomes too loud that it will affect the person you’re sleeping with. Once it detects, the snore the Smart Nova will activate to help decrease the volume of your snore. When you first purchase it, the Smart Nora comes in a medium sized pouch or box with all of its components on the inside. This design gives you an organized place to keep the product and also allows you to bring it around with ease. Travelling with it wouldn’t be much of a problem so there’s no worry about that. So first, what is this Smart Nora? How does it work? What it does is that it comes with a device known as a pebble that listens to you when you sleep and a white flat device that will be inserted in your pillow case below your pillow. The white flat device will inflate and deflate according to the sound the pebble obtains. The Nora will activate itself when the snorer just about reaches a point where the snoring will disturb the partner (level of snoring shown in graph above). When it activates the device will inflate the pillow slightly causing your snoring to decrease in volume. This is because when the pillow is adjusted with the device, the position of your head will alter which will reset your breathing. The pillow inflates causing your head to be slightly inclined, allowing your airways to open and thus improving the snoring. When the snoring stops the device will deflate and it gently lowers your head position to a comfortable position. If the snoring reoccurs the device will inflate the pillow once again. Each cycle of the inflating and deflating take approximately 1 minute to complete. Pebble and overhead mount – The listening device with a look of a large hardboiled egg. The pebble also comes with a mount which allows you to mount it on the wall. It has a light indication on the front of the pebble that shows you when the device is connected via Bluetooth as well as when it needs to be recharged. The back of the pebble has a power button to switch in on and off, a Bluetooth button and sensitivity setting allowing you to adjust how sensitive the pebble will be to detect your snoring. Base – This is the main engine of the Smart Nora. The base has a white control box on the inside to control the inflation setting of the pillow insert. This is how high the pillow will inflate and to adjust the movement of the pillow. The plastic tube attached to the flat device will be plugged into the base. The pump in the base will pump the flat device to inflate. White flat device (Pillow insert) – A plastic tube is attached to the device that causes the pillow to inflate and deflate when activated. Comfort sleeve – flat device is inserted in the comfort sleeve then inserted into pillow case. Gives the device some padding so that it will not be uncomfortable to sleep on. How do you use this anti snoring device? When you first get your Smart Nora, take all the components out of the casing and only keeping the pump in the case. Connect the tube from the pillow insert to the base. You should plug in the power cord from the base which is the main engine of the Smart Nora into the plug point. Switch on the base unit and connect the pebble to the base unit as well. The pebble is fully charged when the green light indicator stops flashing. Once you’re done setting up insert the white panel into the pillowcase. Make sure it is placed correctly to ensure that you get to use it properly. When you’re ready to use, unlock the pebble to turn the pebble on. You can set the 30 minute delay on the pebble to allow you to sleep first before the pebble starts to activate itself. Connect the pebble via Bluetooth by pressing the Bluetooth button at the back of the pebble. For optimum results, store the pebble 8 inches from your head. You can mount the pebble on the wall with the mount provided or keep it on your bedside table as well and make sure that it is one the same level as your head. The base of the Smart Nora can be kept under or at the side of your bed. Do take note that you will need some time to be able to use the device properly. Getting used to it may take a week or two. What makes the Smart Nora Different? When it comes to the Smart Nora, it just seems to check all the boxes. It brings you comfort, doesn’t cause any side effects, easy to use and it improves sleep more many couples. The Smart Nora is different from other snoring solution devices. A typical snoring solution device would need you to insert or put the device on certain parts of your face, neck or jaw but with the Smart Nora it is completely contactless. Most people find some snoring solution devices quite uncomfortable as you would need to position your head a certain way or sleep a certain way and is sometimes difficult to fall asleep in. However, with the Smart Nora it is different as it allows you to sleep in any position so long as your head is placed above the device. The smart Nora is sized perfectly that it covers the whole length of the pillow which is the reason why the user will be able to sleep in any position. The Smart Nora comes with a step by step manual which will guide you on how to set it up. The manual also addresses certain concerns or questions regarding the device and what you should expect when using the device as well. This allows you to set it up with ease and less complications during your use of the product. It also comes with a casing that has everything inside allowing you to use it anywhere due to its easy mobility. Hence, when travelling there’s no need to worry about your snoring troubling others again. The Smart Nora is also a quiet machine. People that use it say they don’t hear the sound from the pump at all. So this ensures that you will not be troubled in your sleep. When it comes to sleeping, comfort is the most important. Using the Smart Nora, you can use your own pillow and you just have to insert the device into your pillow case under your pillow. This allows you to use it while still using your favorite pillow. The device also comes with a padded insert which gives you the extra comfort. With the insert, you will not feel like you’re sleeping on a hard surface. Another thing is that when the pillow is being inflated, you will not be able to feel it or be woken up by it when you are asleep as the pillow is being inflated at a slow and gradual speed. The Smart Nora also gives you the option to allow the Nora to be activated after 30 minutes. This allows you to not be disturbed by the inflation of the pillow if it does inflate when you are at the stage of falling asleep or in the beginning stages of sleep. The good benefit is that the Smart Nora comes with a 30 Night trial which allows you to test the product out before getting it. They also provide a 1 year warranty to the device and a 100% money back guaranteed. As the device will be an investment for you, making sure it works for you is important because a product that works on someone else might not necessarily mean it works on you and with the 30 night trial this allows you to test it out before committing to it. Our readers have also shared with us about how the Smart Nora completely transformed their lives and have said that their snoring has improved so much and even their partners are extremely happy with the product. Not only that, but the manufacturer themselves have conducted sleep tests to show that the device does work. Many say that their sleep has improved much due to the movement of the pillow that enhances their breathing while they sleep and their partners sleep has improved as well due to the improvement of the snoring. Although the Smart Nora is quiet, some users claim that if you’re a light sleeper and a side sleeper, your ears will be pressed against the pillow which may cause you to hear sounds of the pump when the pillow is being inflated. This might affect or disturb your sleep as well. If you’re not sleeping directly on the device, maybe you slept on the corner edge of the pillow, the Smart Nora will not work properly and will not give you the full effect. As the device is sized to fit your pillow length wise all you need to make sure it that your head is directly positioned on your pillow. Another thing to take note of is the sensitivity of the pebble. Depending on the placement and which setting of the pebble, sometimes the pebble will detect sounds that are not the loud snoring and inflate your pillow. It might pick up the snoring of your partner instead and inflate the pillow. Our readers said that sometimes even sounds of heaters, baby monitors or even talking will be detected causing the pillow to inflate. This problem might be troubling to you but it can be solved by adjusting the microphone so that it picks up sound near to it and picks up your loud snoring only. However, there still might be some occurrence of unwanted inflation of the pillow due to the microphone detecting different sounds that are close by as well. Many people found some form of problem with the sensitivity of the pebble, so you might need time getting used to it. Some users have reported that the device does not work on them. Some still snoring with the use of the Smart Nora. However it might be due to the individual having a different reason to snoring. As the Nora is designed to change your head position to allow more air to come in. If your snoring is due to something else it might not work as well. The Smart Nora is a creative invention seeking to help reduce snoring problems. There has been prove that the Smart Nova does work. Many people claiming their sleep has improved much and their snoring volume decreasing very much after using the Smart Nora. 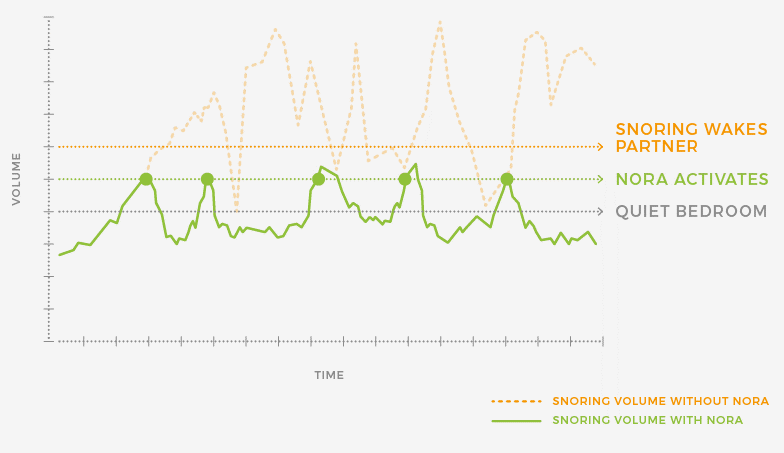 The device has been tested and shows that the snoring volume does improve with the use of Smart Nora as shown in the graph above. When sleeping with partners who snore, the Smart Nora helps couples have good sleep and not be disturbed by any snores. With Smart Nora, couples can go to bed without worries about your snores. Although it does have some disadvantages, some of it can be reduced or avoided in time and when it comes to faulty devices received, they have their 30 day full return guarantee and a 1 year warranty as well. The Smart Nora is definitely worth a try especially if you snore loudly and sleep with a partner.